In the haste to come up with some last minute baby gifts I have returned to my knitting of baby hats. Years ago that was my obsession. I made all sorts of hats many were given away and others have yet to be gifted. Here are a few variations of the Berry Baby Hat by Michele Sabatier. It was a pattern that looked cute to try, something different from what I usually make. Instead of using a purple yarn to make it look like a berry I decided to use some stash yarn to make some fall baby hats. I had a few skeins of Ella Rae lace merino in red orange and emerald green. Not enough to make significant sized garments but hat sized definitely. 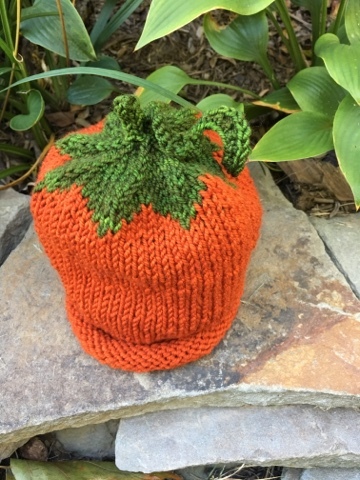 For the pumpkin hat I followed the pattern as written then knit a small tendril to sew on the top near the base of the stem. Very cute. I'm experimenting with another design where the stem will be brown and I'll add a tendril and possibly a leaf. I'm not finding a decent pumpkin leaf in the pattern library on Ravelry so that is my biggest roadblock. 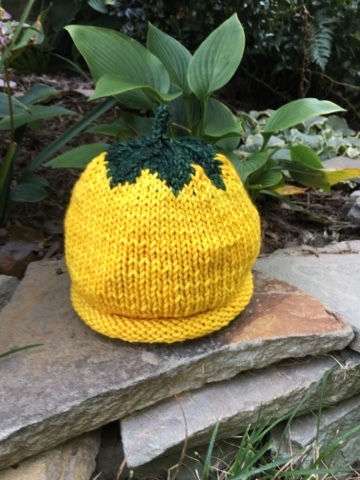 The yellow squash hat is made from some stashed Madeline Tosh Vintage. I used the last bit of chamomile and laurel green for the top. I love this cheerful yellow. The girls think it's more of a daffodil hat than a squash. I'll take that in to consideration when knitting another one. I like that daffodil idea on though....I can see adding some petal edging that resembles daffodils. A very good idea.